This comforter is amazing!! Its the perfect size and weight for year round comfort. I love that it's machine washable so no need to pay an arm and a leg at the cleaners. You will be so comfortable with this Elegant Comfort DownAlternative Double-filled Comforter. With a 1200 thread count from100-percent Egyptian cotton, this cozy comforter features abaffle-box design and double-needle stitching to ensure an evendistribution of warmth without bunching. 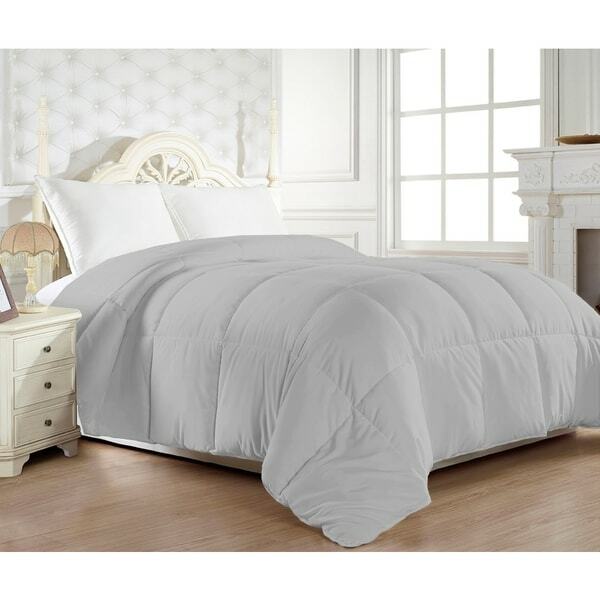 Hypoallergenic, this whiteor grey comforter is perfect for anyone of any size bed. I bought this comforter to go with my new CalKing mattress. I prefer down alternative and live in Southern California so the warmth level is perfect. The 1200 thread count Egyptian Cotton feels like it's good quality and it's oversized so it's never longer on one side of the bed versus the other. This was a good purchase. The blanket was great! This was for our three year old to help her transition into her first big girl bed and into her own room. It fluffed up great after we washed and dryed it. It's still a little stiff but I think it's just from the newness of it. My 14 year old son wants one just like it! We got the grey color and I love it. It's a light soft grey/off white and is perfectly neutral. I have never purchased an Egyptian cotton blanket before so I did not know what to expect or can't compare it to anything similar. Its not the softest thing I've ever bought but it's new and only been washed once but it is very fluffy, cozy and I think I would be happy if it was on my bed as well. This is by far, hands down, the nicest comforter I have ever owned. I bought mine in the grey, and it is a soft dove grey color that goes perfectly with the iron bed and other decor in my master bedroom. The cover is a crisp, 1200 thread count and you can certainly tell by the feel that it's a fine Egyptian Cotton. It's of a medium weight and perfectly warm enough for a southern winter night, but it's not too warm in the air conditioned summer time. I used to get warm at night with my old comforter, so much so that I would have to throw it off a couple of hours after going to sleep. Not so with this crisp, comfy beauty. I have washed and dried it in my he large capacity washer and dryer and it comes out beautifully. I do go in a couple of times during the dry cycle to move it around some because it is so large. You can definitely tell from the look and feel that this is a double-filled comforter. I would advise anyone on the fence to not let this one get away. You won't be sorry. A wonderful comforter for an excellent price point. Alternate was a word I avoided until I learned about my allergies. This Alternative Double-filled Comforter is doubled with Comfort. It is not heavy and we enjoy ir on warm nights as well as cold. Glad we bought this one. I spent way too much time going over every single comforter on Overstock! But, it paid off. I toggled Amazon and several other sites....no comparison. Overstock had the best price and selection...by far. My expectations were a champagne desire and beer pocketbook. It doesnt matter how much it "was" and is now when your budget is a certain amount. Ok..here it is. I wanted the more expensive down alternative Egyptian 1000 cotton oversized comforter but even discounted it was over my budget. This one arrived and it really is 99% perfect. It is soft, warm but not too warm. The color is a little lighter than the picture. And it did not fluff up as tall as the picture. For the price....I am very pleased with this comforter. But...if my budget had been higher, I would have bought the oversized 1000 Count Egyptian cotton. 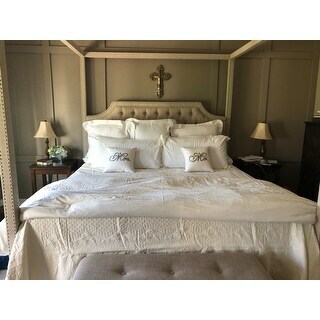 Ps....California King covers my king sleigh bed. I bought this comforter insert in Cal King size for our master bedroom duvet. It is lightweight, cozy, with box stitching so the stuffing will stay in place. I like that it is a down alternative which means no animals were harmed just so we can be warm in bed and its better for any allergy sufferers. The other reviews below that talk abt this down comforter being a bit small for a King sz. duvet are accurate. But, it isn't so small that it's unbearable on the bed. I find that the comforter covers the top part of the mattress, end to end, side to side. Down the road I'll eventually look for a true King comforter & just put this one on our Queen size guest bed, but for now it's fine. True to description as far as warmth. We live in FL where even our winter days can be in the 70's. This really is the perfect amount of warmth & fluffiness. Highly recommend, can't beat this for the price. Thx! Beautiful comforter. I love the Egyptian Cotton, and the 1200 thread count is very luxurious. Love the double filling, its perfect to snuggle up in and stay nice and cozy warm. Usually a "King" comforter is still too small for the duvet covers and it gets lost. This fits well and stays put in the duvet. It is very cozy! I love the look and the feel of this comforter, it is very warm and I was able to remove all the blankets as it is enough. It is absolutely beautiful! The only issue is my bed is a king size and the comforter isn't quite big enough to lay over each side evenly. I have to bring one side down so that the mattress isn't showing- I have this problem with almost every comforter, or guilt I have bought - I wish that manufacture's would take this into consideration and make them wider. I do love the comforter and it feels great! The comforter is just beautiful, I filled my new duvet with it and the size was perfect. It's warm and cozy and not over hot as I like sleeping in a cold room. Once again Overstock did not disappoint, thank you for great service. This comforter is better than 5 stars, it is fluffy, washes well, looks great, and it keeps you warm. You can snuggle in just like a real down. I will never buy any other comforter. Nice comforter however I purchased it to use inside my duvet cover and was disappointed that it did not have the corner ties to attach to the duvet cover. When I receiver this comforter, I was a little disappointed it wasn’t fuller, but after sleeping with it for a night, it is perfect. I gave it four stars because it doesn’t have loops on the corner to tie a duvet cover to. I put safety pins on the corners instead to keep it in place on the duvet. We folded the duvet and placed it at the end of the bed. We love it. I got this comforter in the same shipment as my 800 thread count sheets. The sheets were thick, soft and cool to the touch, this blanket feels hot and scratchy in comparison and should not be represented as 1200 thread count Egyptian cotton. I have a queen bed, I should have ordered a king sized comforter, as I wanted the blanket to come down to the floor like in the advertised picture, it only comes down halfway. I am returning this item and will shop locally for comforters so I can touch and feel them. Beautiful, Excellent Quality and Exactly as described. The price was so good that I purchased 3. I highly recommend for all! Sweet Dreams! This comforter is a perfect match for the duvet that I also ordered. We have used it for a winter and a summer now and it was wonderfully comfortable during both seasons. I bought this comforter to go into a duvet. It was so plush I use it as a comforter. The material is very durable. It turns any bedroom into an elegant oasis. "Does it have corner ties?" "What is the fill amount for the King size? How many ounces?" This has a 50 Oz Fill Weight. "The king/cal king dimensions say 106 x 90 long. Is it 106 long, 90 wide? A cal king mattress is 84 inches long so seems short?" It is 106 Wide X 90 Length. "What is the fill weight for the twin?" The twin has a 50 Oz Fill Weight. "Is the grey more of a light grey or dark grey? It looks pretty light on my screen." Hello melner18, reviews of this comforter have mentioned that it's a light soft grey color. We try to represent the colors of our products accurately. Unfortunately, due to the difference in monitor colors we cannot guarantee that the color will match exactly what you see on your screen. Thank you for shopping with us. It is a soft dove grey color. It looks very elegant and is super soft and plush. Reminds me of a comfoter from a 4-5 star hotel. After having ordered my previous comforter from Overstock 6 years ago, it was finally time to get a new one. Plus my husband and I wanted to be the first to review this one. This is a replacement comforter for our new Cal-King bed. We prefer the down alternative and this "double-filled" comforter should look decadent on our new bed.